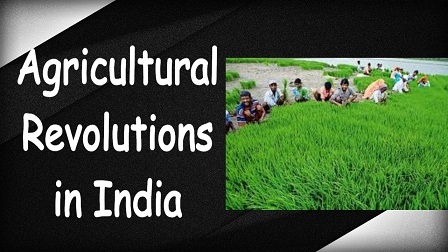 Here is a list of Important Agricultural Revolutions in India which will help you in exams like UPSC, BPSC,SSC MTS,SSC CHSL, SSC CGL,Railways and other Banking Exams like IBPS, RBI, SBI Clerk etc. Protein Revolution Higher Production (Technology driven 2nd Green revolution). Coined by PM Narendra Modi and FM Arun Jaitely. Blue Revolution Fish Production Dr. Arun Krishnan. Brown Revolution Leather / Cocoa / Non-Conventional Products. Golden Fiber Revolution. Jute Production. Golden Revolution Fruits / Honey Production / Horticulture Development Nirpakh Tutej. Pink Revolution Onion Production / Pharmaceuticals / Prawn Production. Durgesh Patel. Evergreen Revolution Overall Production of Agriculture. Started in 11th 5 year Plan. Silver Revolution Egg Production / Poultry Production Indira Gandhi. Red Revolution Meat Production / Tomato Production. Vishal Tewari. White Revolution (or, Operation Flood) Milk Production. Verghese Kurien. Higher Production (Technology driven 2nd Green revolution). Govt. set up of a Price Stabilisation Fund with a corpus of Rs.500 crore to help farmers deal with volatility also A Kisan TV channel will be launched for providing real-time information on new techniques, water conservation and organic farming. The agri-tech fund will be used to make farming competitive and profitable, step up public and private investment, develop agro-technology and modernise existing agri-business infrastructure. The fund for enhancing warehousing capacity has been enhanced to Rs. 5,000 crore, Rs.100 crore has been set aside for providing every farmer a soil health card also Rs.56 crore for mobile soil-testing laboratories. Father of Ever green revolution M.S.SWAMINATHAN. Renowned as Father of Ever Green revolution in India, Swaminathan emphasized the need to improve productivity in perpetuity without associated ecological and/or social harm. Exploitive agriculture offers great dangers if carried out with only an immediate profit or production motive. The emerging exploitive farming community in India should become aware of this. Without arrangements for drainage in Irrigation would result in soils getting alkaline or saline. Unmethodical use of pesticides, fungicides and herbicides could cause adverse changes in biological balance, which lead to an increase in the incidence of cancer and other diseases. Therefore, the initiation of exploitive agriculture without a proper understanding of the various con-sequences of every one of the changes introduced into traditional agriculture, and without first building up a proper scientific and training base to sustain it, may only lead us, in the long run, into an era of agricultural disaster rather than one of agricultural prosperity. Green Revolution is a term, which refers to a series of research, development, and technology transfer initiatives, occurring between the 1940s and the late 1970s that increased agriculture production worldwide, particularly in the developing world beginning most markedly in the late 1960s. The main purpose was to save over a billion people from starvation. The green revolution changed the life of about 70% population dependent on agriculture22. Nearly 5-times increase in production of food grains (50 to 257 million tonnes) has resulted in a buffer stock of 55.49 million tonnes and export of more than 7.46 and 4.27 million tonnes of rice and wheat respectively in 2012. The 4-fold increase in oilseed production (8 to 30 million) rescued the country from huge import of edible oil. The production of fruits and vegetables has increased 3 times in last 50 years and we are the second largest producers in the world. Potato revolution is not only parallel to that of wheat but also higher magnitude than of rice. It led to sizable increases in returns to land, so raised farmers’ incomes also stimulated the rural nonfarm economy, which in turn grew and generated new income and employment of its own. The real per capita incomes of Asia almost doubled between 1970 and 1995, also poverty declined from nearly three out of every five Asians in 1975 to less than one in three by the year of 1995. The absolute number of poor people fell from 1.15 billion in 1975 to 825 million in 1995 despite a 60 percent increase in population. Many research studies show that much of these steady declines are attributable to agricultural growth and associated declines in food prices. It contributed to better nutrition by raising incomes and reducing prices, which help people to consume more calories and a more diversified diet. Mainly increases occurred in per capita consumption of vegetable oils, fruits, vegetables, and livestock products in Asia after the revolutionary part. It resulted in environmental degradation. Increased income inequality, inequitable asset distribution, and worsened absolute poverty. It stimulated a large body of empirical literature on how agricultural technological change affects poor farmers. Small farmers were either unaffected or harmed because of it resulted in higher input prices, lower product prices, and efforts by landlords to increase rents or force tenants off the land. Milk Man of India: Verghese Kurien. White revolution is the success story of dairy cooperative movement in the country and the Operation Flood Program launched by government of India with international cooperation. It is intended to be at the same time parallel, complementary, supplementary and corrective to the green revolution. Small and marginal farmers whose holdings were not suited to green revolution technology could be inducted into the alternative productive process of dairying. Agricultural labourers who are displaced from employment by mechanization could be provided compensatory employment and income from dairying. 112.5 million Tonnes in 2009-10 in India made it the highest milk producer in the world. Poultry industry of India is growing at the rate of 8-10% for eggs and 15-20% for broiler owing to improved breed and modern management. Oil Seeds, Edible Oil, Especially Mustard and Sunflower. Indian oilseeds production scenario from a “net importer” status in the Eighties to a near self-sufficient” status during the early Nineties has been popularly termed as the “Yellow Revolution”. From a mere 11 million tonnes during 1986-87, achieved record oilseeds production of 32 million tonnes during 2010-11. The main contributors to this factor are- the oil seeds production technology, expansion in area under oilseed, price and market intervention support policy and the institutional support. The latter experienced spectacular increase in area, yield and production, whereas the pulses remained stagnant. Lather/ Cocoa / Non-Conventional Products. It is happening in the tribal areas of Visakhapatnam district. The tribal people are being taught and encourage growing environment-friendly and socially responsible coffee to carter the demand. Father of Golden Revolution: Nirpakh Tutej. From 1991 to 2003 is termed as Golden revolution, when there was a huge increase in the production of Fruits, Honey Production and other Horticulture products.